Mel and Madge Flanagan La Point married October 10, 1906 at the home of her parents in the Town of Poygan. They met in Weyauwega while my grandmother was working as a "hello girl"; that's what telephone operators were called then. They had nine children, three dying in infancy. Russell, my dad, was the oldest, then came Vera, Donald, Carvel, Dale, and the baby Virginia. Grandpa taught school for a few years, later clerked. 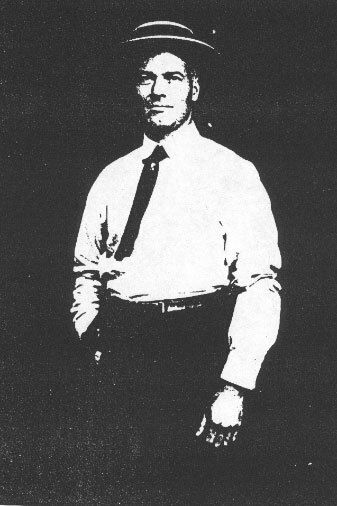 He taught in an elementary school in School District #1 in the Town of Little Wolf during the school year of 1897-1898. His father Charles that same year served on the School Board. He worked many different jobs during his working years, the last of which was as an elevator operator at the old Raulf Hotel on Main Street. He worked there sometime in the late 1940s as I recall. Although I was twenty-five when my grandfather died, I can't say I knew him or knew much about him. I don't recall ever having a conversation with him of any notable length. He didn't seem to be around much when I was growing up, and when we did visit he kept his thoughts and feelings to himself never really entering a conversation as far as I could tell. He was reserved, reticent in the extreme, and didn't seem to be a functioning member of family gatherings. I can't remember him either in movement or in authority. It was as if he was a guest in his own house. What I most remember was his stiff index finger, the one, I believe, on his left hand. The skin on that finger was pink and shiny, the finger of course useless, always pointing out. I remember it as an oddity, but a fascinating one. I was always staring at it. Grandma La Point, on the other hand, was more of a social being. She took great joy in her friends, her family, and she loved social discourse. She had opinions and expressed them. She liked people who were vibrant, friendly, alive. 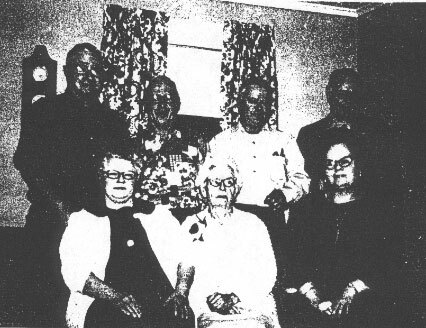 Madge was the oldest of the family of Patrick and Julissa Flanagan. She was an accomplished musician and played with the Flanagan Band. The band was comprised of her Uncle Jim, Uncle Mike, and Aunt Sarah Jane most of the time. "One time when she was here for a visit," related her niece Margie Rawson, "we asked her where she would like to go for a ride. 'You know,' she began, 'when I was about sixteen I rode across Lake Poygan in a sleigh to play for a dance at Orihula, and I have never been back there since. We stayed all night and went home the next day. It must have been St. Patrick's Day or Valentines. I would really like to go there.'" "Her life has not always been as easy and relaxed as it is now," writes Mrs. Rawson. "It seems as I think of her that she had had more troubles then could possibly be anyone's share, but she never let it get her down. She can see the funny side of anything and is always ready to go somewhere if there is a chance." In her later years grandma spent time writing letters and writing history. She kept a diary for many years and it is there where I visited her for the first time since her death in 1977. The diary which began in 1935, continued until 1976 was rewritten by her son Donald at the behest of his mother. There were things, according to Donald, that my grandmother did not want others to see. Nevertheless, her abridged writings do shed light on her family, and provides a written record of events that were important to this wife, mother, grandmother, and one with many friends in her large and extended family. It is evident from her entries that she loved her family very much, and even though life brought to her much trouble, much pain, she showed little or no resentment. There was indeed little rancor in her feelings or in her thoughts. "She raised six children during the years when everything was hard to get and little help to be had. She sewed for them by a kerosene lamp, mixed lots of bread and kept boarders," writes Margie Rawson, "and she did this at times when her husband worked out of town." They moved about a lot when their family was growing. My dad, the oldest, lived at fourteen different addresses, not counting his two stays, about a year each, with each set of grandparents, first in Little Wolf, later as a teenager in Omro. And she did not have her "own" home until she was past seventy. She lost three children in infancy, two boys and a girl, and she never had much in material wealth, but, as more then one has said, she was rich in family and friends. "February 4, 1956. Ella called this morning and said Russell has cirrhosis of the liver." "September 23, 1957. Russell and Ella separated due to drinking problem." "May 13, 1960. It was quite a surprise to have Carvel walk in as we hadn't seen or heard from him in over five years." "June 12, 1967. In the P.M. Dale surprised us. Had supper with us and left soon afterwards. In June of 1961 he was last here." "September 3, 1973. Carvel's birthday 59th. Have not seen him since May, 1960." Grandpa La Point at the age of 35. My dad and his parents. It appears that the picture was taken in Marshfield around 1913-14. 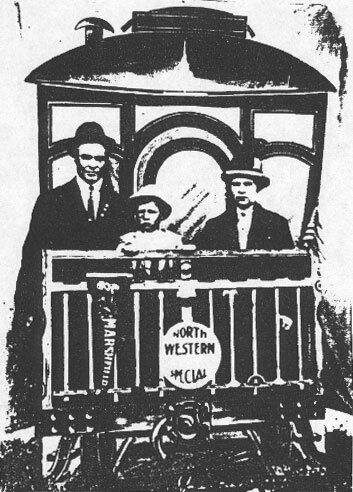 The La Point Family. Standing: Russell, Donald, Dale, Carvel. Seated: Vera, Grandma, Virginia. Picture taken in the 1970s. "The Texas Stompers." Uncle Carvel is on the left and Uncle Donald is on the right. 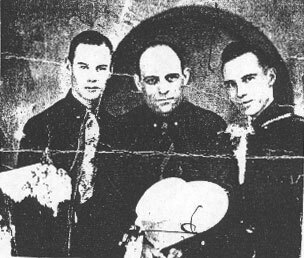 This band toured Texas and Pennsylvania in the mid-1930s. 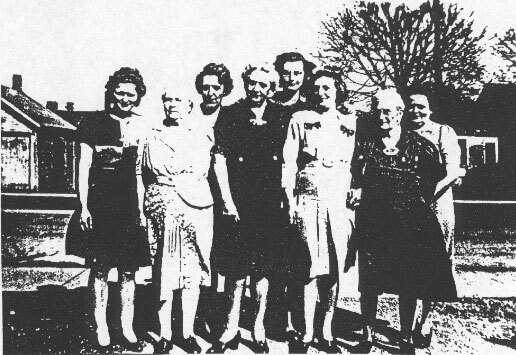 Pictured in 1946 in our front driveway on Minnesota Street are from left: Aunt Virginia, Grandma La Point, Aunt Hertha, Grandma Abel, Cousin Vera Jane, Mom, Great Grandma Flanagan, Aunt Lillie. 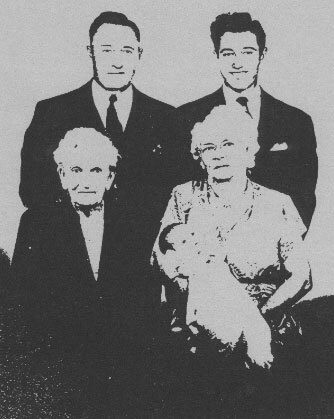 A five-generation picture taken in 1951 when Patti La Point was born. My Dad and brother Rich are standing. Great Grandma Flanagan and Grandma La Point are seated. 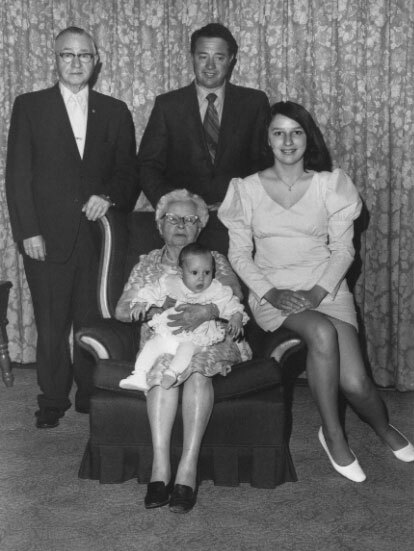 Another five-generation picture taken in 1971 with Patti's daughter, Jackie. Russell and Rich La Point are standing. Madge La Point and Patti Larson are seated.